We closed out our tasting with two styles of Cabernet Sauvignon. 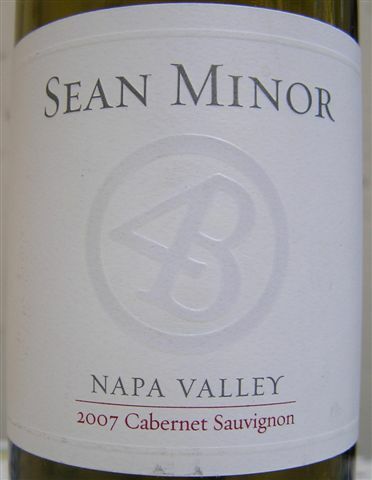 Napa Valley led the way with Sean Minor 4 Bears 2007 Cabernet Sauvignon. Established in 2005, Four Bears Winery is named for the husband-and-wife founders' four children. Despite their new run on the winemaking scene, Sean Minor is turning out some excellent juice at price points so low, you'd do well to stock up on cases of the ones you like best. Their 2007 Napa Valley Cabernet blends 83% Cabernet Sauvignon with Merlot, Petit Verdot and Cabernet Franc. The black-fruited beauty delivers the aromas and flavors of cassis and cedar that make Cabernet so irresistible. 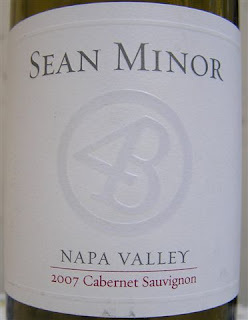 Unlike fruit-bomb Cabs, the medium-bodied Sean Minor delights with currants and blackberry fruit balanced by dusty earthiness, acidity and toasty oak. There's enough grip in these tannins to suggest this wine will get even better in another year or two. But why wait? Enjoy this wine now with burgers, ribeyes off the grill, smoked mozzarella, roasted bitter vegetables such as radicchio or sautéed escarole. The release price was $17 but you'll find it for a few dollars less at LA Wine Company and Dan's Wine Shop in Palm Desert. If you get a chance to try the Sean Minor Pinot Noir or Chardonnay before we do, drop a comment to let us know what you think.